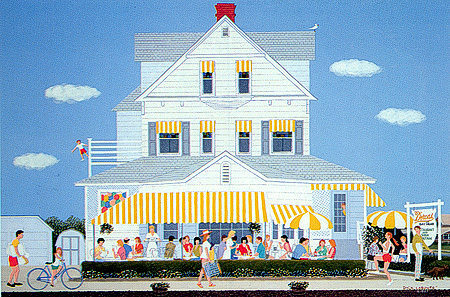 Dorcas of Bay Head, the little restaurant-fountain founded by a great lady, the late Dorcas Cotsworth, was a favorite subject of artists. LaBonte tried to capture the sprirt of the place on a Sunday morning. The building itself was one of Bay Head's first, built as the Land Company's office in 1883 when the town was just a promoter's dream. It continued as a real estate office until 1920, when it became the Clover Cottage, a luncheonette run for 24 years by Charles and Lottie Tilton, later by the Wojciks. In 1965 it became Dorcas's, and was a soda fountaint and gathering place for teens, eventually changing over to a full restaurant. That's Dorcas peeking out the door! Her daughter continued to run the business after Dorcas passed away until 2012, when Hurricane Sandy hit the town. It is now the Dune Grass Cafe and still looks very much the same!